Sure, you could use those sweet, ripened bananas to make banana bread. Or you could make this showstopping cake drizzled with chocolate. Your call! Chop 3 oz. chocolate. Beat butter and granulated sugar in large bowl with mixer until light and fluffy. Beat in eggs, 1 at a time. Add bananas and sour cream; mix well. Mix flour, dry pudding mix and baking soda. Add to banana mixture; beat until blended. Stir in chopped chocolate; pour into 12-cup fluted tube pan or 10-inch tube pan sprayed with cooking spray. Bake 45 min. or until toothpick inserted near center comes out clean. Cool in pan 10 min. Invert cake onto wire rack; gently remove pan. Cool cake completely. Transfer to plate. Microwave remaining chocolate in small microwaveable bowl on HIGH 1 min. or until melted when stirred. Stir in cream cheese until melted. Add powdered sugar; mix well. Stir in milk. Drizzle over cake. 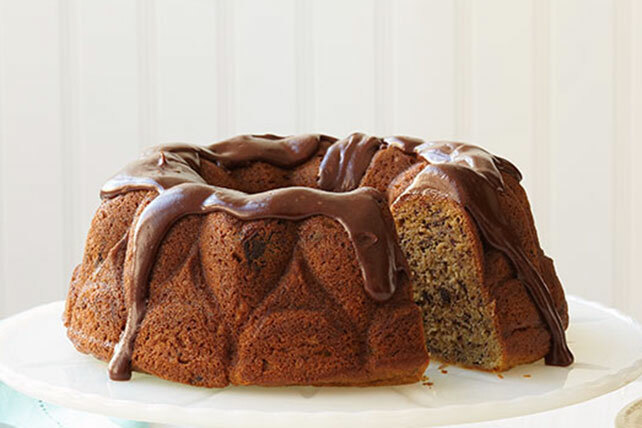 Enjoy a serving of this easy-to-make Banana-Chocolate Chip Cake on occasion, but keep portion size in mind. One cake makes enough for 16 servings. Sprinkle with 1/2 cup chopped toasted PLANTERS Walnuts after drizzling with chocolate glaze.